As foodies it’s notoriously hard to impress us. Such is the diverse offering of restaurants that we are lucky enough to have on our doorsteps here in the UAE, that to stand out and make us come back for more, is no easy feat. Believe us. With apprehension on the eclectic Anantolian menu and an uncertainty on what to expect from Grosvenor House’s latest dining destination, we edged one hungry foot forward towards Rüya on an uncharacteristically wet and windy Saturday evening. 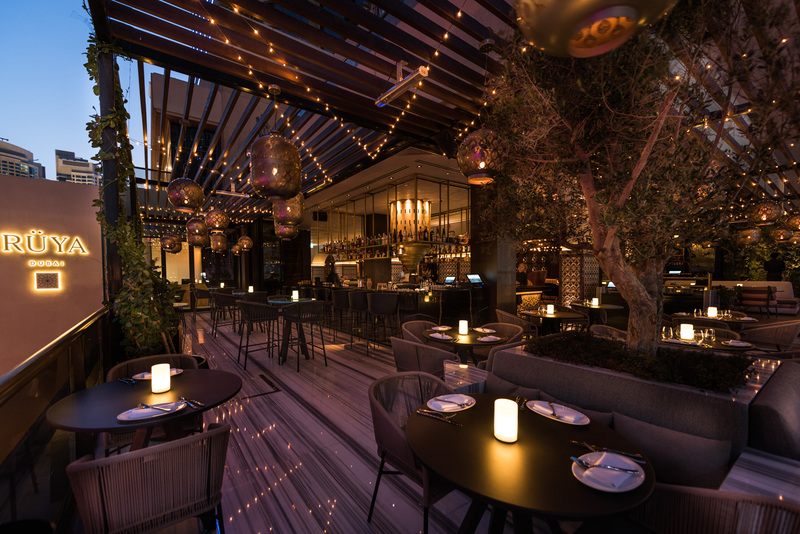 Rüya, meaning ‘dream’ in Turkish has been on our radar for some time now and we felt it necessary that we discovered what this mysterious restaurant had to offer Dubai diners. Known to have come from the group that operates UAE culinary institutions such as Coya, Zuma and the now legendary Nusr-Et and with Chef Colin Clague previously of Jean-Georges Dubai at the helm, expectations for this newbie were always going to be high. Located on the upper lobby level of Grosvenor House’s first tower, Rüya certainly boasts a stylish entrance. Greeted by perfectly groomed staff dressed in head-to-toe white we were ushered inside with traditional Turkish hospitality. Rüya could teach one or two other restaurants a thing or two about first impressions. A contemporary venue with iconic, focal light fixtures and sporadic tables dotted around a rather inviting looking bar, Rüya wouldn’t look out of place in cosmopolitan cities such as London or New York. Seated in oversized red leather arm chairs, the table is lit only by the flicker of a gold-encased candle and is comfortable enough that you could sink into and let the hours pass you by as you gaze upon the well-healed, stylish clientele that walk through the door here. But the presentation of the vast menu stops you in your tracks. Despite the luxury inspired decor and the flurry of attractive guests and staff alike, Rüya feels anything but pretentious in fact, the restaurant evokes a welcome warmth that further thrives on its vibrant atmosphere. The menu here focuses on an authentic yet innovative take on Anatolian cuisine with dishes designed for sharing and socializing, paying homage to the family style of a traditional Turkish kitchen. Considering ourselves experienced diners and having tried dishes from all over the world, all over the world, we were quite surprised to find that between the both of us, we were unable to decipher what most of the dishes on the menu actually were, honing in instead on grilled chicken wings and fillet steak, in a deseprate search for anything that was remotely familiar. Now, how you experience Rüya completely depends on what type of foodie you are; you either enjoy being educated and surprised on cuisines of the world or the thought of eating anything that you can’t pronounce, see or that doesn’t come with a side order of fries terrifies you. Rüya is definitely for the first type of diner. Something that sets this restaurant apart is the staff. Our waiter not only really knew his stuff when it came to the food from his home country but his passion for educating us and aiding in recommending dishes based on our dietary preferences, was not only welcome but highly commendable. This is not a restaurant where you will be forced to try something that you are uneasy about eating and as we found out through a full run down of each and every dish on the menu, most dishes are twists on regular Middle Eastern cuisine and it is only the unfamiliar name that lends itself to angst. It’s recommended to start with a selection of hot and cold starters and share with your dining partner. Cold starters include dishes such as Levrek (Seabass Sashimi with apple, mustard and shaved radish) and Karpuz Peynir ( burnt watermelon, sheep cheese, tomato and pine nuts). As the weather was unusually chilly outside we decided to only order a mix of hot starters to warm us up and were happy to go with our wait staff’s recommendations. Although perhaps not the most aesthetically pleasing of dishes the Icli Köfte were really quite delicious, a small bowl of fried bulgar stuffed with roasted duck & barberries.For those that don’t know Köfte are a take on a class Turkish meatball made from ground meat, garlic and herbs. We also opted for Borek, a dish consisting of filo wrapped parcels of feta cheese with carrots, zucchini and walnuts. The great thing about Rüya’s menu is there actually is something for everyone. From carnivores to pescatarians and even vegetarians, such is the diverse nature of Turkish cuisine, full of flavours and wonderfully rich food. Even notoriously fussy eaters will find something that they can enjoy here, you just have to ask. For main course, there is so much choice it is impossible to choose just one dish and upon recommendation, we happily opted for a small selection. Portions are of good size but if you’re feeling hungry ordering four main dishes between two people to share is perfectly advisable and acceptable here. Being a lover of lamb is preferable at Rüya, for many of the dishes on the extensive menu are made up of this meat. For those that are less experimental with their food the Çag Kebap from the ‘Central Oven’ section on the menu is a great choice. Following the idea of the common ‘kebab’ dish which consists of a skewer of small pieces of meat, diners here are invited to choose between meats or even ordering a combination of Chicken, Lamb and Beef. Displayed beautifully on a thin layer of Arabic bread, the meat is thinly sliced and pierced with a skewer. As succulent as it is tasty, the marinated chicken was a personal favourite of ours, in fact we could have eaten it twice over! Also, from the ‘Central Oven’ we were encouraged to try the Two Cheese Pide with slow cooked egg as part of our fine dining educational journey. We were both interested and excited to learn that Pide is in fact Turkey’s version of a pizza and a comfort food favourite. Bread is filled with, well whatever you fancy (in this case cheese) and then baked for a fantastically crispy exterior. In fact, traditional Pide takes pride of place on Rüya’s menu with alternative takes on this popular meal such as Fennel Pide with red onion, ricotta and Kale and Pumpkin Pide with pinenuts and pomegranate being some notable (and delicious) alternatives. Moving onto the ‘Izagara’ or ‘Grill’ section of the menu here is where you will find more recognizable (and decipherable) dishes such as Grain Fed Beef with asparagus & Antep pistachio butter (which tastes as amazing as it sounds) and Grilled Tiger Prawns with caramelized fennel & fennel butter. Unable to choose further between the Adana Kebap (spicy minced lamb with grilled tomato) and the highly recommended Keşkek – Barley Risotto with pulled lamb & spices, we ordered both and devoured both. The Keşkek comes in a traditional clay pot and delightfully displays a twist on the classic risotto as we know it. Creamy, sticky rice is fused together with chick peas and strips of pulled spicy lamb for a completely unique taste. On the plate it does not look much but the burst of flavour you receive is something truly unique, easily one of Rüya’s signature dishes and one a description will not do justice. Seafood lovers can delight with the Pan Fried Sea Bass with almonds simit & sumac or the Pan Fried Red Mullet with hazelnuts and artichoke. There is a generous selection of side dishes that can accompany your courses such as Rice pistachio pilaf with spinach & herbs and Duck Fried Chips triple cooked duck fat chips with Turkish chili for those that are not watching their waistlines. The desert menu is again as adventurous as you wish to make it with standard sorbets and ice creams sitting alongside dishes such as Watermelon & Lion’s Milk and Revani & Honey which is a sticky yet sweet dish ideal for those that favour their deserts. With a beautifully furnished terrace that hangs over the glistening waters of Dubai Marina alongside a sleek and stylish inside bar area, your night need not end after your meal has ended at Rüya. Rüya’s cocktails were developed by an expert mixologist who developed a signature cocktail list revolving around classic Turkish flavors and ingredients such as hibiscus, rose, pomegranate, honey, spices, citrus and mint. The cocktails and mocktails here are as creative as they are contemporary in both taste and presentation and have been designed to encapsulate the spirit of Turkey. The Anatolian Fizz is a must-try being a refreshing combination of pomegranate molasses, Citrus, Rose, Raspberry and Sparkling Wine. For Gin lovers the Turkish Tonic Gin is a fun twist capturing the essence of Anatolian flavours with its citrusy base – managing to be both refreshing and detoxifying in one. We were pleasantly surprised by Rüya; it’s modern authenticity is spot on and its innovative take on Anatolian cuisine manages to bring the soul of Turkey to Dubai, turning traditions on their head and injecting passion and personality into classic dishes that result in culinary creations that are rich in taste, flavour and sustenance. From the opulent gold interiors and instagram-worthy tiled walls to the love of fine fare that is evident through each and every person that works there, Rüya manages to seriously raise the bar of Dubai restaurants, providing both a unique gastronomic experience with an educational one.